I’ve said it before, but if you’re breaking out in a sweat because you haven’t made the right restaurant reservation yet and you’re afraid your Other Half is going to be Doghousing you, or you’re single and grumpy about it, I will say it again: Valentine’s Day isn’t really about love anyway. February 14th is the feast day, according to the Catholic calendar, of Saint Valentine of Terni, a 3rd century Roman martyr. Very little is known about him except that he was beheaded on February 14, 269 CE. It’s not even completely clear how or why he ever became associated with courtly love. Celebrating Saint Valentine is not even required by the church: He’s in the “if you don’t have a more important guy to venerate on that day” portion of the hagiographies. My point obviously being that if the Holy See considers it an optional celebration, you totes have permission to do likewise. So, now that you’re staying home and devoting your Romantic Evening time to getting soused, I propose that you pick a cocktail with a focus on bitters, because… well, I don’t need to explain that, right? Bitters are a little confusing because they cover a wide and ever-increasing range of products, but the main deal is, they are a neutral spirit base infused with any number of botanicals, they originally developed as medicines and many do indeed have strong medicinal properties, and they’re very concentrated, so you use them by the drop or dash rather the way you would use vanilla extract in baking. An explosion of house-made and craft-distiller bitters based on every single thing you can think of and many things you maybe can’t has dominated cocktail culture in recent years and shows no sign of abating, so you have lots of options to play with. A couple of the classic cocktails any self-respecting home bartender should be able to whip up are defined by their bitters: the Sazerac by Peychaud bitters, the Manhattan and the Old-Fashioned, among many, by Angostura bitters, both of which have been around for-flippin’-ever. Craft bitters are, however, proliferating in every imaginable direction, and while some are easier to find than others, here are a few ways to go beyond the Old-Fashioned and into the Newfangled. As a bonus, many of these cocktails happen to be a striking red color. You know, like blood. And, some are super-simple and a few are master class situations (I haven’t personally gone anywhere near that Bazaar Bloody Maria, it’s way over my pay grade). But hopefully there’s something bitter for you to try at any level of cocktail-moxie. Happy freakin’ V-Day and may the expression “bottoms up” mean something way cooler at your house than it probably will at mine. Directions: Rinse martini glass with a little absinthe and ice, stir and let sit. Fill a shaker with ice, add Maker’s Mark Bourbon, Aperol, bitters, and vermouth and stir gently. Discard the ice and absinthe and strain the cocktail into the glass. Garnish with a strip of orange zest. Directions: Muddle the raspberries first. Shake all ingredients together with 3 ice cubes. Strain into a Collins glass. Top with soda. Garnish with candied ginger. Directions: Stir all ingredients in a mixing glass and pour into coupe glass. Directions: Shake first five ingredients with ice. 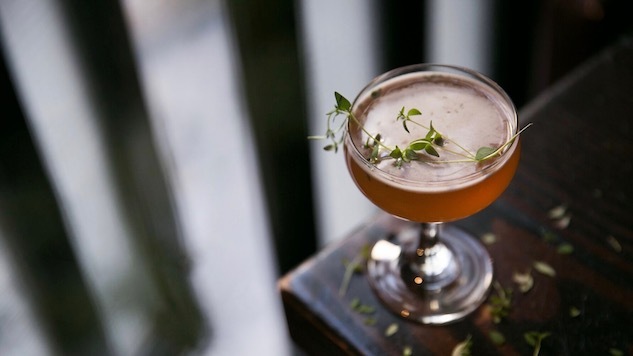 Then strain into an absinthe-rinsed coupe, top with a float of Prosecco and garnish with a fresh thyme sprig. Directions: Add ingredients to a mixing glass. Add ice, stir and strain in a chilled coupe. Garnish with a lemon zest. Directions: To make ice cubes: Blend ingredients together thoroughly and strain for seeds. The night before, make the Bloody Maria ice cubes and freeze each color individually. In a highball glass, Crush/smash 1-2 Bloody Maria ice cubes of each tomato color. Fill the highball glass with the ice, layering by color. In a separate glass, combine 2 oz. Patrón Reposado, .75 oz. lemon juice, 3 dashes Bitterman’s Hellfire Bitters, 5 dashes Horseradish Tincture. Directions: Combine sherry, fig rosemary maple syrup and bitters. Serve in rocks glass with ice ball. Garnish with rosemary sprig, lemon peel and orange peel.